Few games have had the enduring popularity and genre-defining quality of Sonic the Hedgehog. A mascot for Sega ever since his debut in the early 1990s, Sonic has spawned a legion of spinoffs and sequels, and remains a popular choice for console gamers to this day. Now he’s back in his original glory on the iPod. Sega of America has developed the original Sonic the Hedgehog, the same game you may remember from the Genesis console, for the fifth-generation iPod, iPod classic and third-generation iPod nano. It’s a fast side-scrolling action game that really shows off the iPod’s performance, although the control scheme, which is dependent on the iPod’s Click Wheel, is ultimately deficient and really hurts the play value of this game. If you’ve somehow missed the Sonic phenomenon, here’s the deal: A cartoony blue hedgehog wearing a pair of snazzy red sneakers has to stop an evil genius (Dr. Robotnik) who wants to turn the world’s animals—all of Sonic’s friends—into mindless automatons. To that end, Sonic runs from level to level, collecting golden rings and Chaos Emeralds, and, as time and circumstances permit, he can also roll into a ball to crash through barriers and bounce on the robot monsters he finds, smashing them open and freeing the fluffy bunnies, duckies, and other animals hidden within. Sonic can catch power ups along the way, getting more rings, temporarily invulnerability, and quicker speed. Ultimately Sonic also has to square off against a series of bosses as he finally gets to the evil doctor himself. 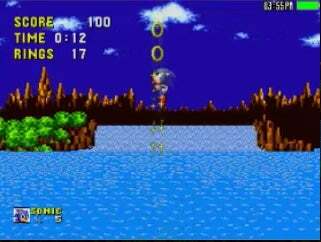 If you’ve played Sonic on the Genesis (or the original side-scrolling game as it’s been resurrected for modern systems like Xbox 360 through Xbox Live Arcade), this is the exact same experience. It’s very fast-paced, frantic gameplay, with the same high-energy theme music and sound effects that you remember. Sonic the Hedgehog is one of the fastest-paced side-scrollers around, but controlling Sonic’s actions with the Click Wheel is a chore. Sonic, in its various incarnations, has been intended to be played with a game pad—a device that has a directional pad (d-pad) on one side and a button on the other to control Sonic’s jumping. In the iPod’s case, everything happens on the Click Wheel—you control the direction he runs by holding down either the back or forward button on the Click Wheel and pressing the center button to jump. You can manage this one hand—barely—but unless you have the reflexes of a 10-year-old on a sugar rush, you’re probably going to find this incredibly frustrating in about 10 seconds. Sonic employs two different control schemes—Scheme A, as it’s called, is a two-handed method that requires you to get both thumbs on the Click Wheel and actually click the buttons in order to make Sonic run and jump. Scheme B, a one-handed scheme, uses touching instead of clicking. Neither scheme works particularly well—neither has the precision or control of a d-pad with a separate button. That, unfortunately, kills Sonic on the iPod for me. It’s not unplayable, but it’s incredibly frustrating. And the last thing I want to do is be frustrated while I’m playing a game because of wonky controls, something that I, as a player, have no control over. Please don’t get the impression that Sonic is poorly developed. In fact, it looks and runs fabulously, lets you save at the beginning of any stage you reach, and provides you with an unlimited number of continues, so you can keep playing as long as you like. A tutorial will help you get started, and the game includes all six worlds you’ll find in the original console cartridge version. And it’s clear that the developers sought to overcome the game’s most basic problem—its control system being designed for a fundamentally different device. But unfortunately, their creativity in doing so doesn’t work around the iPod’s shortcomings in this area. That’s not to suggest that I think Apple has made a mistake with the iPod’s design. I just don’t think, ultimately, that Sonic the Hedgehog is the right game for the system. It’s a shame, because I really wanted to like this. I’ve loved Sonic since the day I got my Genesis in 1991. Unfortunately, all that love can’t overcome some fundamental problems, and so I reluctantly pass this one by. Sonic the Hedgehog for iPod is a great trip down memory lane and superbly well done, but proof positive that some games just shouldn’t be made for the iPod.